Welcome to Kid's College! Designed for students ages 3 to 17, these classes provide enrichment for imaginative young minds. Many are delighted with the chance to develop new skills and explore topics in creative settings. Students enjoy hands on activities not only in the art and engineering classes, but also in classes designed to foster reading and mathematics. Classes are set during the day, evening and Saturdays to accommodate the busy schedules of today's families. Want to sign up for a course? See the How to Register for Non-Credit Courses guide. For more information or to register, please call 815.280.1555. When Camden Zielinski attended Boys Technology Camp at Joliet Junior College a few summers ago, little did he know that a camp for 6th-8th graders would impact his education and career goals in such an instrumental way. This Fall, the Shorewood resident will be entering his senior year at Providence Catholic High School in New Lenox, but has been attending Technical classes at JJC since he was an 8th grade student. His positive experience in Boys Technology Camp along with a curiosity to figure out how things work is what truly inspired him to pursue this path. Camden explained that as early as 9-years-old he enjoyed taking things apart and fixing them. He would ask for tools like saws and drills instead of toys at Christmas-time and birthdays. Camden would spend hours working in the garage to fix just about anything. He even started his lawn mowing business at age 10. He said that school was boring to him so his mother was always trying to find different activities to interest him. In Summer 2012, Camden's mother Lucy signed him up for the inaugural Boys Technology Camp offered through JJC's Kids College. Technology Camp is held for three-days and provides students with an opportunity to explore various Technical career pathways in a hands-on environment. Technical areas include: Architecture, Engineering and Construction, Automotive, Computer Aided Design & Drafting (CADD), Electrical, Industrial Maintenance Technology, Manufacturing, Orthotics & Prosthetics, Robotics and Welding. 3D Printing in the MakerLab was added this year to showcase the innovative technology. Intriguing as the camp sounds, it wasn't exactly an easy task to convince Camden to go. He reminisced about the first day of camp when his mother was driving him to JJC. Camden said, "I was having a fit in the car and didn't want to go because I thought I would have to sit there and just listen. But thank goodness, she made me go." What Camden, who was heading into 8th grade, didn't realize about Technology Camp is that he would actually get to learn by doing. All of the activities are hands-on and include things like making a foot impression, testing electrical circuits, using a Virtual Welder and much more. Camden added, "I really liked the hands-on activities, we were busy and it was fun!" Brenda Large, JJC's personal enrichment and kids college coordinator, said, "One of the main goals of Technology Camp is to emphasize Science, Technology, Engineering and Math (S.T.E.M.) to students and demonstrate how it's such an important part of our everyday world." Large added, "Students also get to learn about multiple career pathways and find out what options are available depending on their interests." Students are taught by JJC's Technical professors who share knowledge and experience in their respective areas. The faculty donate their time to teach Technology Camp in the summer. Their passion to inspire these young students about S.T.E.M.-based career opportunities shines brightly during camp. 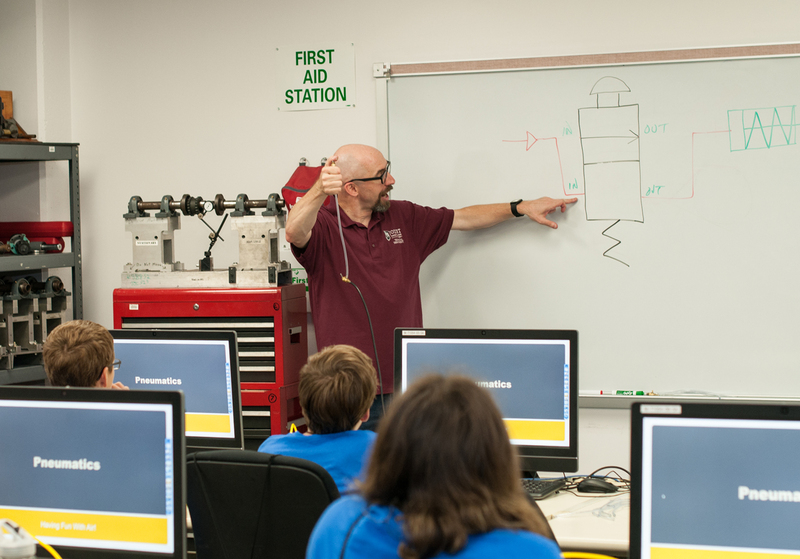 One prime example is JJC Technical Professor Dr. Jeff Bradford, who teaches the Pneumatics session and currently serves as the Technical Department Chairperson. During camp, Bradford took notice of Camden's talent and enthusiasm. He encouraged Camden to consider taking a college class at JJC. Bradford said, "I believe having a true determination to succeed is instrumental in college success. Camden exhibited a passion for the subject matter, and I sensed that determination in him." After giving it some thought, Camden decided to sign up for IMT 121 - Industrial Fluid Power in Fall 2012 at JJC while also attending 8th grade. Bradford added, "He'd been interested in things mechanical and electrical prior to Technology Camp. I believe when he realized that he could learn more about the subjects he was interested in at JJC, he became more interested in attending school. And, I hope he learned that learning does not have to be boring." However, being the youngest student in a college class had its challenges. He remembers Dr. Bradford told him that the expectations are higher and he would have to conduct himself like a responsible adult. Camden said, "At the beginning, as a grammar school kid, it was intimidating to go to school with adults but when they realized I knew what I was doing and was serious about learning, they accepted me." Camden added, "Dr. Bradford has been an incredible resource and mentor to me." I am grateful for his time and guidance and that he took an interest in me." Camden began by taking one class per semester at JJC then gradually moved up to two classes. 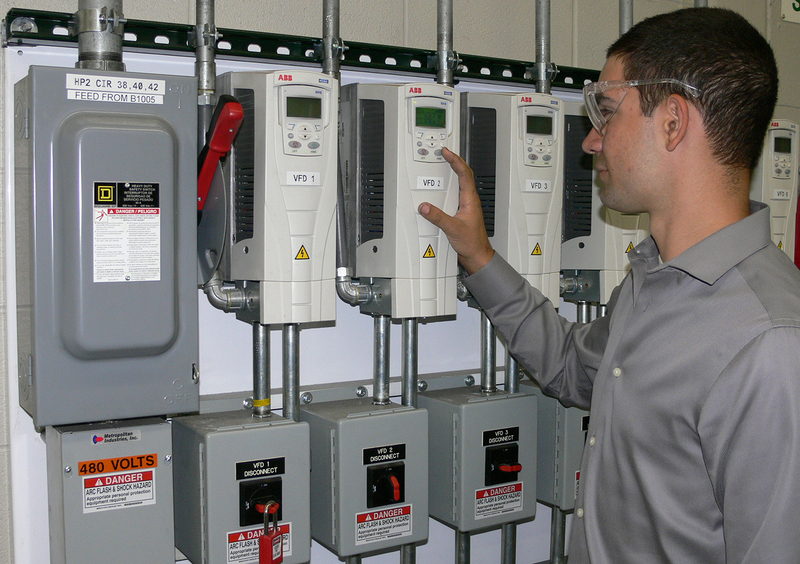 He has already taken technical classes such as: fluid power/pneumatics, electrical wiring, welding, industrial maintenance, industrial controls and industrial management. Camden said he enjoys that the technical classes are hands-on classes and that he can apply what he learns. He earned a Certificate of Completion in Industrial Maintenance in May 2015. By the time he graduates high school, he will have 38 college credit hours under his belt. He has not only managed to juggle high school and college classes but also finds time to work in industry to gain experience. He said, "Most students do extracurricular activities such as sports; and my activity is going to college and working." Throughout the school year and summer breaks, Camden is already utilizing his skills in the workplace. A few of the exciting opportunities include fabrication and welding of race cars at a race car shop and electrical wiring of the corn maze and pneumatics for the haunted house props at a local pumpkin farm. Camden is also going to Haiti this Winter with his church group this to help build houses. Camden plans to finish his Associate Degree at JJC and is considering the Southern Illinois University Program at JJC for Industrial Management & Applied Engineering. It's amazing to think that going to summer camp sparked such an interest that it would shape his college and career goals. He said, "Technology Camp really helped me figure out what I want to do and be excited about something in life." Camden's mother also expressed her gratitude and is overjoyed at watching the positive transformation her son has made in his academic career since his involvement in Technology Camp four years earlier. Amy Murphy, director of JJC's Corporate & Community Services, said "Technology Camp is just one of the many ways that we raise awareness about career pathways and generate interest in S.T.E.M.-based curriculum as part of our community outreach efforts." She added, "This camp is a great eye-opener for students because they are able to roll up their sleeves and find out for themselves." Technology Camp is offered every summer for boys and girls in grades 6-8. For more information, call (815) 280-1555 or visit www.jjc.edu/LLC.